Neroli Oil is distilled from the flowers of the bitter orange tree. It has a very strong, refreshing, spicy, floral fragrance and is calming, soothing and sensual. Carnelian restores vitality, motivation and stimulates creativity. It gives courage, promotes positivity and encourages stability, sharpening concentration and improving analytic abilities. 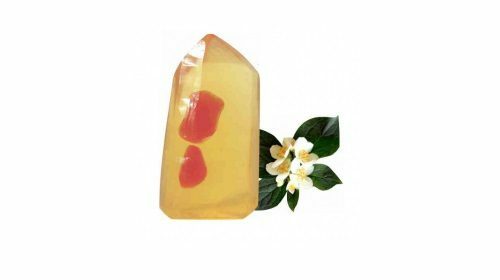 Our handmade glycerine soaps are one of the most indulgent and moisturising soaps available. Their unique properties allow them to be effective on all types of skin, including sensitive or hypoallergenic skin. Our soaps are made from 100% natural vegetable your skin glycerine and contains a neutral pH which will continue to moisturise throughout the day. Colloidal silver is a liquid suspension of microscopic particles of silver. It is a powerful broad spectrum Microbial Solution which contains silver ions and has amazing germicidal, antibacterial, anti-fungal, infection-fighting and healing properties. Colloidal Silver has been found to be helpful in healing cuts, wounds, rashes, acne, fever blisters, athlete’s foot, insect and spider bites, sunburn and tissue re-growth. Spoil yourself with one of our handmade organic glycerine soaps, containing a variety of fragrant essential oils, crystal gemstones and colloidal silver.